Dancing Rain, who won the Investec Oaks at Epsom in June and last month's German equivalent, proved she is the queen of Britain's middle-distance fillies when landing the QIPCO British Champions Fillies' And Mares' Stakes. Trainer William Haggas said of Dancing Rain: "That was fantastic for us and she is a very good filly. "If she keeps winning like that she will get the recognition she deserves - she didn't get much credit for winning the Oaks and because she didn't do too well in the Irish Oaks [in which she was fifth] her Epsom win was dismissed as a weak race. We always felt she had plenty to offer and I'm grateful to Nick Mordin in the Racing Post Weekender and the Irish Field who steered us towards the German Oaks. "When you win a classic you want the feat to be recognised, but I am more keen to support an event like this which I think is such a breakthrough for British racing in trying times. We've got four runners today and to have a winner is fabulous for us." Of Murtagh's performance, Haggas said: "It's always a good ride by the jockey when your horse wins, but Johnny is a top-class rider. He was very cross after the Irish Oaks [in which Dancing Rain was fifth] for not making enough use of her and he came in and said he wouldn't make the same mistake twice. "My wife Maureen rides this filly every day and she said she felt as good as ever coming into today's race. Full credit to her - she deserves praise, too. "The plan is to go to Japan on November 13 to run in the QEII Cup won by Snow Fairy last year and we're looking forward to that and she'll be back next year with an exciting programme." Bible Belt (14/1) ran the race of her life to claim second place, two lengths behind dual Oaks heroine Dancing Rain in the Group Two QIPCO British Champions Fillies' & Mares' Stakes, and trainer Jessica Harrington was thrilled with the three-year-old's performance. The Big Bad Bob filly won her first three races this season, including a nine-furlong Group Three, before failing to fire on her penultimate start at the Curragh in which she was 17 lengths seventh in the Group Two Blandford Stakes over 10 furlongs on yielding going in September. Harrington declared: "I'm thrilled with her. She's back to how she was before her last run - she just doesn't go on that soft ground that we had at the Curragh and Fran (Berry) said even this ground here is a little bit slow. That was a serious step up for her. "Having had that last run, which was bad and on bad ground, I was thinking have I done the right thing or the wrong thing in coming here. "I don't know what the plan will be now. It will depend - she is nominated for Japan and Hong Kong so we will see if get invited. She will definitely stay in training at four. "She is a smashing filly and she is tough. That was a career best effort and she had never been over a mile and a half before in her life. Her full brother gets a mile and a half well." 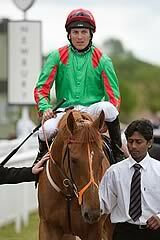 Jockey Fran Berry said: "I am very happy. She was disappointing last time. We thought she was high-class and she proved that today. She got the trip really well but the winner just outstayed her." The John Gosden-trained homebred Gertrude Bell (16/1), who races in the colours of the trainer's wife Rachel Hood, has earned a date with Oasis Dream after rounding off a fine racing career with third place in the race, a further two and a quarter lengths behind the runner-up. Gosden stated: "We are thrilled with her. The winner has come back to her Oaks best and we are delighted. She has two wins this year, one being a Group Two, and third in this. "She is now off to be bred to Oasis Dream, she's retired now. Not a bad effort for my wife's first homebred." Jockey William Buick said: "She ran very well and I am very happy with that."